We built T.S. Hess & Sons Excavating in Pipersville, PA a new warehouse so they could move the business to a bigger site designed specifically for house excavating equipment. Tim Hess, owner of T.S. Hess & Sons Excavating in Pipersville, PA, needed to relocate his business to a bigger site designed for excavating equipment. The building on the current site that housed the equipment wasn’t suited for storage and repairs, nor was the heating system adequate to work on equipment during cold winter months. Tim connected with us when he excavated a site for another QVC client. We built a storage facility for that client similar to the building Tim had in mind for his business. He was so impressed with the results for that client, he hired QVC to build a large new warehouse with an attached office for his business. Tim came to QVC with hand-drawn sketches of a building with an attached office. Our designer worked with Tim to refine the design and create a 3D model of a 7,600 square-foot warehouse that was divided into two sections, a 4,000 square-foot shop, and a 3,600 square-foot equipment storage area, plus a 700 square-foot attached office. 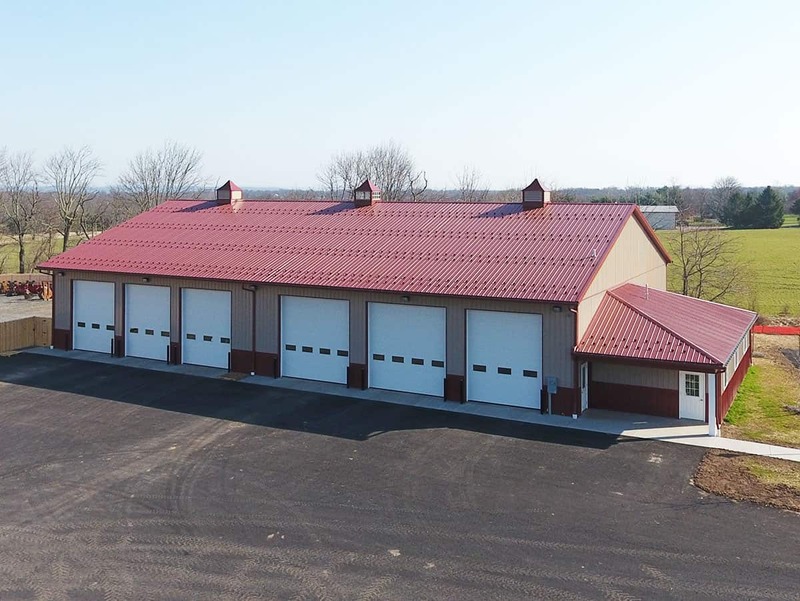 We recommended special features to meet their needs, including a mezzanine, scissor trusses, and a radiant floor heat system for optimal efficiency. The shop houses a mezzanine nine feet above the floor that holds wooden shelves for small-parts storage and enough room for a work bench featuring wooden steps, floor, and railing, plus steel posts and high beams for support. Scissor trusses open up the middle of the ceiling to accommodate excavating equipment like dump trucks, which need to be fully opened when working on repairs. The vaulted ceiling is 20 feet high in the center, which is four feet higher than the rest of the building. The radiant floor heat provides the warmth needed for making repairs during the winter while using less heat. This was a very important, energy-efficient feature for those cold months the company spends repairing equipment. If need be, it will be simple to expand the building, adding on to it to make it longer and add more garage doors. The project was completed at the end of 2017. Tim really liked working with our engineer and architect and our suggestions for better efficiency and cost effectiveness customized to his company’s needs. Tim was thrilled with the aesthetics of the exterior of the building as well as the quality of construction. He was very pleased with the process and our flexibility of meeting him where he was in the project.